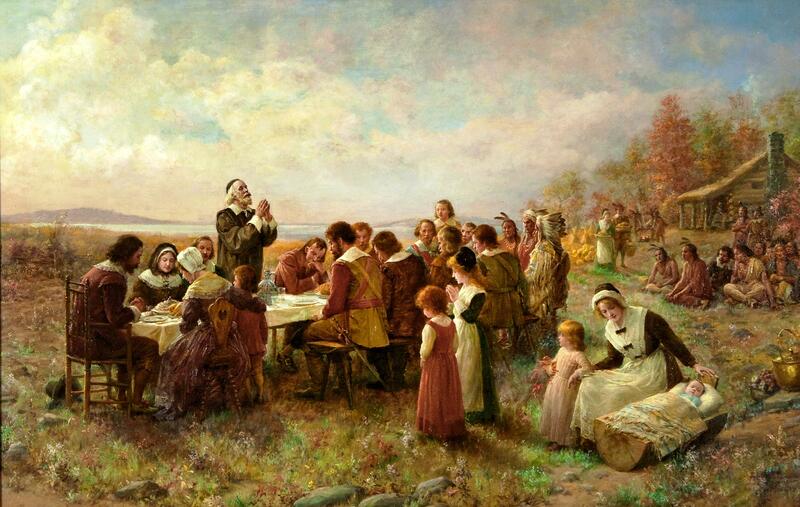 “The First Thanksgiving at Plymouth,” Jennie Brownscombe, 1914. 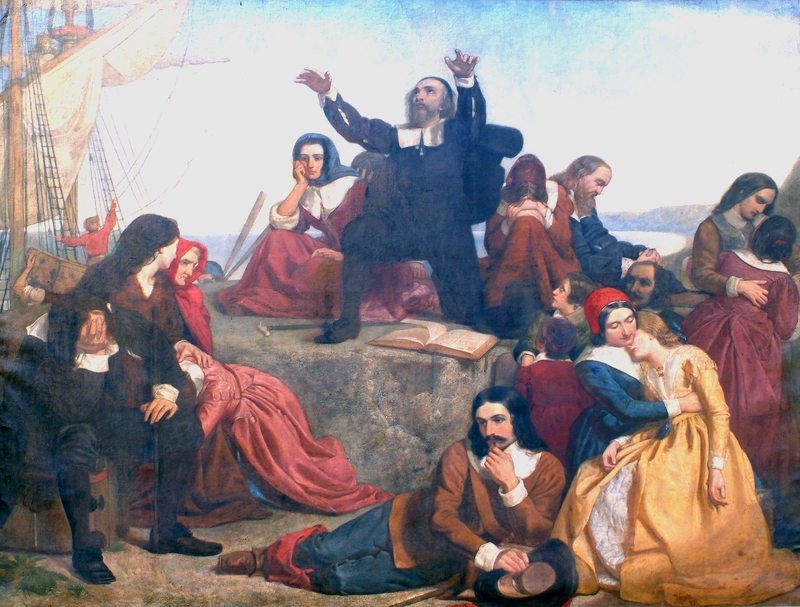 Arguably one of the most famous depictions of the event, Brownscombe’s work suggests that the Pilgrims outnumbered their Native American guests. In reality, there were likely at least twice as many Wampanoag as Pilgrims at the feast. But the clincher was that much of the adjacent land had already been cleared for planting, which would save them incalculable labor. The Pilgrims unknowingly had landed in a region of present-day Massachusetts that had once been teeming with Native Americans, but sometime after 1617 the entire region had been devastated by disease, possibly bubonic plague or viral hepatitis contracted from European fishermen. Thousands, perhaps tens of thousands had died in the epidemic, whole villages being wiped out so suddenly that there was no time to bury the dead. The new home the Pilgrims would call Plymouth was actually the abandoned village of a tribe called the Patuxet, where as many as two thousand individuals may have lived scarcely five years before. There were remnants of other peoples nearby—chiefly the Wampanoag (the closest), Massachusetts, Nausets, and Narragansetts—but with the exception of the last, these also had been recently decimated. Perhaps of greatest importance, it was Squanto who served as the Pilgrims’ interpreter and facilitated peaceful, if often tense, relations with the nearby Wampanoag. Since first landing at Cape Cod, the Pilgrims had repeatedly sighted Indians at a distance, and even traded shots with a group of Nausets, but except for the message they conveyed when they discharged their weapons, they had not as yet actually communicated with any of the native peoples in the area. With Squanto’s aid, in March of 1621 the Pilgrims agreed to a kind of mutual-defense pact with the Wampanoag sachem (or chief) Massasoit, one that both sides honored, incidentally, for more than fifty years. All of this makes it plausible to believe that, when God granted the Pilgrims a good harvest, they would have invited their Native American neighbors to join them in their 1621 harvest celebration. Perhaps they did. Yet it bears emphasizing: four centuries after the fact, we still don’t know for sure how the Wampanoag came to be at the Pilgrims’ feast. The belief that the Pilgrims invited them as a gesture of good will is sheer conjecture. No direct evidence survives to prove it. In fairness, according to an English merchant who visited Plymouth in 1623, when William Bradford remarried in the summer of that year, the Pilgrims invited Massasoit and the Wampanoag to the wedding celebration. That they did something comparable two years earlier for their harvest feast is not implausible. And yet, Edward Winslow’s ambiguous reference to “Indians coming amongst us” leaves open the possibility that they simply showed up, uninvited, expecting hospitality. This, too, is plausible, for they had a track record of doing precisely that. According to Winslow, the very day after the Pilgrims concluded a peace treaty with the Wampanoag the previous March, “divers of their people came over to us, hoping to get some victuals as we imagined.” This initiated a pattern the Pilgrims would come to know well. In the coming weeks, the Wampanoag “came very often” and in force, bringing their wives and children with them. By late spring the problem had gotten so bad that Governor Bradford sent a delegation to the Wampanoag settlement to “prevent abuses in their disorderly coming unto us.” Traveling to Massasoit’s home in present-day Rhode Island, a commission of Edward Winslow and Stephen Hopkins first presented the sachem with a handsome red “horseman’s coat” trimmed in lace. Then, as diplomatically as possible, they explained to the Wampanoag leader that, while his people were welcome to visit, the Pilgrims “could no longer give them such entertainment as [they] had done.” Translation: don’t plan on staying for dinner every time you pay us a visit. Even if Massasoit and his men were invited, we err when we remember the First Thanksgiving as some kind of idyllic multicultural celebration. It was likely tense at best. The Pilgrims had been schooled to see the Native Americans they encountered as bloodthirsty “savages”; even after the feast one of the Pilgrim writers would describe the Wampanoag as naturally “cruel and treacherous people.” The Wampanoag had learned to view Europeans in much the same way, for more than once European sailors or fishermen visiting Cape Cod had kidnapped or murdered unsuspecting natives. If the Pilgrims had arrived just a few years earlier, before the great epidemic had ravaged the Wampanoag, Massasoit’s first inclination would likely have been to drive the newcomers into the ocean. Now with but a shadow of his former strength—and possibly in awe of the Pilgrims’ muskets—the sachem opted for warfare of a different kind: he commanded his powwows to curse the new arrivals. According to William Bradford’s nephew, Nathaniel Morton, for three days the Wampanoag medicine men convened “in a dark and dismal swamp” and “in a horrid and devilish manner did curse and execrate them with their conjurations.” This is a part of the Thanksgiving story we tend not to emphasize. 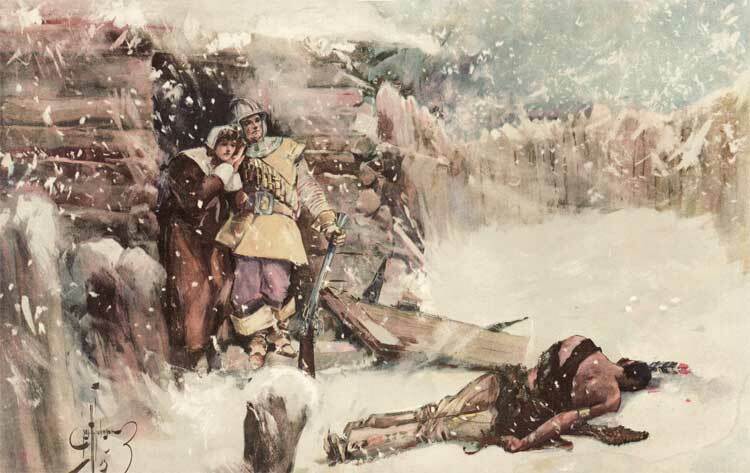 If Morton’s information was accurate, it was only after this covert operation failed that Massasoit turned to diplomacy. It is possible that he was encouraged to do so by the English-speaking Squanto, who saw in this alternative strategy an opportunity to improve his status among the Wampanoag, who had essentially been holding the Patuxet Indian prisoner since his appearance the previous year. Although Squanto figures prominently in children’s books as the Pilgrims’ friend, the Pilgrims soon concluded that he “sought his own ends and played his own game,” as William Bradford recalled. If the Pilgrims’ association with the Wampanoag was often strained, their relations with other native peoples in the area were often worse. Not long after the First Thanksgiving, the Pilgrims received a threat from the Narragansett Indians and began to construct a palisade for self-defense. Fear pushed them to a prodigious pace, for by the end of February 1622 a log fence eight feet high and twenty-seven hundred feet long ringed the entire settlement. That spring they began construction of a fort inside the palisade to render their position even stronger, and after ten months of tedious labor they had completed a citadel at the top of the hill complete with six cannon. While a lot more evidence survives concerning the Pilgrims than we might expect, almost none survives concerning the episode for which we remember them best. 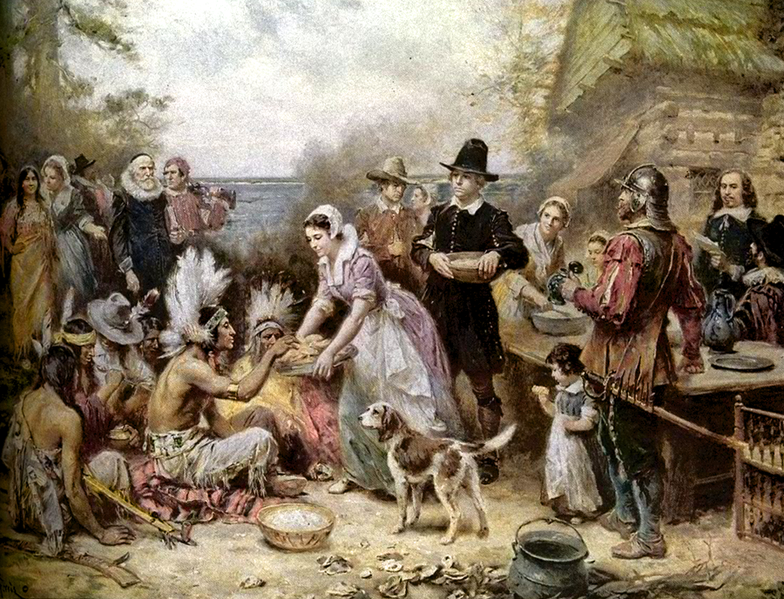 The Pilgrims’ historian and long-time governor, William Bradford, never mentioned a 1621 thanksgiving celebration in Of Plymouth Plantation. 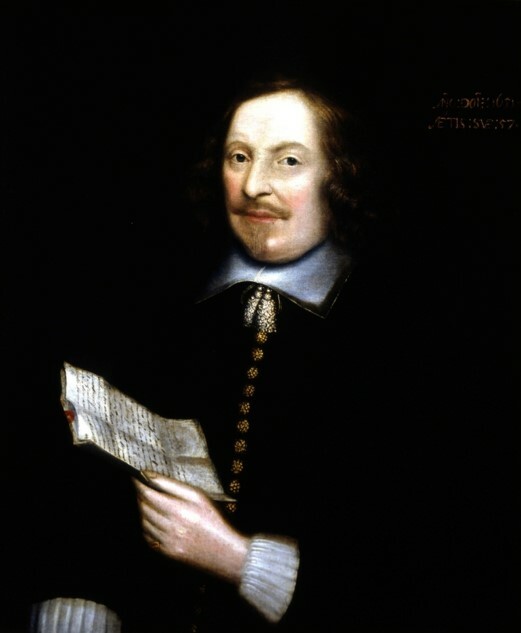 Bradford began writing his history in 1630, quickly bringing his narrative up to the landing of the Mayflower, but he then set the work aside and did not resume it until the mid-1640s. From that vantage point (perhaps referring to a journal long since lost), he still recalled vividly the “sad and lamentable” details of the first winter, the particulars of their negotiations with the Wampanoag, the facts of Squanto’s personal history, even the fine points of corn planting. He also noted happily that the Pilgrims began to recover their health and strength in the spring of 1621, reaped an adequate harvest that fall, and enjoyed “good plenty” as winter approached. What he failed to mention was a celebration of any kind. This should give us pause. It would seem that the episode so indelibly imprinted in our historical memory was not memorable at all to the Pilgrims’ long-time governor. As it turns out, the only surviving firsthand account of a celebration in 1621 comes from the pen of Edward Winslow, Bradford’s younger assistant. Upon the arrival of a ship from England in November 1621, Winslow crafted a cover letter to accompany the reports to be sent back to the London merchants who were financing the Pilgrims’ venture. In his letter—the main purpose of which was to convince the investors that they weren’t throwing their money away—Winslow described the houses the Pilgrims had built, listed the crops they had planted, and emphasized the success they had been blessed with. To underscore the latter, he added five sentences describing the abundance they now enjoyed. These 115 words constitute the sum total of contemporary evidence regarding the First Thanksgiving. It’s a brief, ambiguous account. If we wanted to, we could compile a whole list of details commonly taken for granted about the occasion which we could never prove from Winslow’s brief description. What do we know with any confidence about this iconic event? As we try to imagine the gathering, it would be great if we had a better sense of what the Pilgrims actually looked like, but of course there are no photographs, and the only Pilgrim known to have had his portrait painted was Edward Winslow, but that was not until three decades later. Enough evidence survives for some informed speculation, however. If we could take a time machine back to the occasion, the first thing we might notice about the Pilgrims is how small they were. Europeans in the 17th-century weren’t exactly Hobbits, but they were noticeably shorter and dramatically lighter than we are today. Historians of Elizabethan England estimate that the average adult male stood 5’6”, the average female 5’½ ”, and even as late as the American Civil War, the typical soldier weighed in at less than 140 pounds. With regard to the Pilgrims’ stature, think junior high. On the other hand, the Pilgrims definitely had a taste for bright colors. Plymouth Colony estate inventories contain countless references to red, blue, green, yellow, and “russet” (orange-brown) garments. To cite but two examples, upon his death, carpenter Will Wright left among other items a Bible, a psalm book, a blue coat, and two vests, one white, the other red. The inventory of William Bradford’s estate showed that the long-term governor did, in fact, own a black hat and a “sad colored” (dark) suit, but he also sported a “colored” hat, a red suit, and a violet cloak. If the Pilgrims genuinely viewed their autumn gathering as a time of rejoicing, then they probably left the “sad-colored” clothing at home. We might also be surprised at how young the Pilgrims were and at how few women there were among them. The mortality of the first winter had struck the “saints” and “strangers” in similar proportions, so that the saints from Leiden remained approximately half of the depleted company at the time of the First Thanksgiving. In other ways, however, the “general sickness” had affected the Pilgrims unevenly. The death rate was higher among wives than among husbands, higher among the married than among the unmarried, higher among adults than among children. By autumn only three of the fifty-one survivors were definitely older than forty—elder William Brewster, his wife Mary, and a wool comber named Francis Cooke. The colony’s new governor, William Bradford, was only thirty-one. Among the adults, males now outnumbered females five to one. (The ratio had been about three to one at the time of their departure from England.) The higher death toll among adults also meant that children and teenagers now accounted for roughly half of the entire group (up from approximately one-third before the general sickness). These latter included the wonderfully named Remember Allerton, Resolved White, Humility Cooper, and the two Brewster boys, Love and Wrestling. And yet, in the autumn of 1621 the wounds were still so fresh. It would be no stain on the Pilgrims’ faith if their rejoicing was leavened with a lingering heartache. Widowers and orphans abounded. Fourteen of the eighteen wives who had set sail on the Mayflower had perished during the winter. There were now only four married couples, and one of these consisted of Edward and Susannah (White) Winslow, who had married that May shortly after both had lost their spouses. Mary Chilton, Samuel Fuller, Priscilla Mullins, and Elizabeth Tilley each had lost both parents, and young Richard More, who had been torn from his parents before sailing, had since lost the three siblings who sailed with him. That the Pilgrims could celebrate at all in this setting was a testimony both to human resilience and to heavenly hope.